Grind the onion (medium) with green chillies, cloves, cinnamon and cardamom into paste and keep aside. Grind pudhina separately into paste and keep aside. Pressure cook the rice. Take oil in the kadAi and sauté the mustard with the onion paste for about 5 minutes. Then add the pudhina paste, salt, turmeric powder and sugar and sauté well for about 10 minutes or till the oil comes out. Remove and add to the cooked rice with a little ghI. 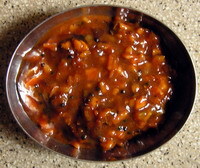 * Ensure that you do not add water to make onion or pudhina pastes. In this way we can prepare the Carrot, Beet root and Cauliflower rice also with the difference that carrot and beet root are to be grated and sautéed well with the onion chilli paste described above. For Cauliflower, separate the florets in small size and sauté as above. Here the ingredients and method are the same as in the case of onion bAth except the aniseed. We also add pieces cut from a medium size onion to the tomato also cut into small pieces. For this we need 4 pieces of medium size tomatoes. Tomato must be sautéed well till it loses its water. If you need it spicier, you can also add ½ tsp each of red chilli powder and coriander powder to the sautéed items. We have already seen how Vegetable biryAni is made and also indicated there that using the same ingredients and method but one of the above vegetables only, you can prepare the bAth of that vegetable. For green peas however you can add poppy seeds (1 tsp) in place of ginger in the paste. The ladies finger (cut into ½ inch small pieces) and Kundhru (cut lengthwise) have to be sautéed well with a little more oil till the water content is totally removed. Sautee green and red chillies, the Bengal gram dAl, 1 tsp of black gram dAl and asafoetida in oil and powder them well with salt and tamarind. Clean the coriander leaves and chop them. Sauté the mustard and remaining black gram dAl in oil. Add the chopped coriander leaves sprinkling a little water for 5 minutes. Add the powdered masAlA to this and sauté for 1 minute. Mix these well with rice already pressure cooked and ghI. For the above, use pachchadi, appaLam or chips as side dish. This is the simplest and healthiest one. It is also easier to prepare. 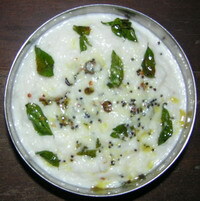 Just add cooked rice with salt to curd (not sour) and mix well. Sauté mustard and a little green chilli and ginger pieces as well as curry leaves in oil and add to this. The BAth is ready. In case you want to carry it while travelling then the curd is likely to become too sour and rice also to be watery. For avoiding this situation, just add milk to the cooked rice with a required salt and just ¼ tsp of curd. This goes well with lemon, mango, garlic, green chilli and bitter orange (Kasappu nArthangAi) pickles as well as vEppilaikkatti, mOre miLagAi and mAgALikkizhangu pickles (Their recipes will be given later). However, the best one is “puLi inji”. For this, you need tender ginger. Wash the ginger, peel the skin and cut into tiny dices. Keep aside. Soak tamarind in 1 cup of water at least for 10 minutes and extract its juice. Strain the impurities. Add the ginger pieces to the tamarind extract with salt and allow it to remain there for 2 to 3 days. The ginger pieces have to become soft. Then take the oil in a kadAi and after it is hot, add mustard to splutter. Add the softened ginger pieces with the tamarind extract, green chilli cut into small pieces, red chilli powder, turmeric powder and jaggery. Allow it to boil and stir it constantly till the whole thing becomes a thick mass and oil comes out to the sides. Allow it to cool. Roast fenugreek, powder and add to this. Mix well. Now PuLi inji is ready. 1. Though colour is very important in your preparations, just for colour sake do not use colour powders, liquid colours or any bright item unless certified by the Food Authorities as they may cause food poisoning. For example, I had seen a hotel in Bangalore using bright red chilly powder that was not at all hot and tasty but was used just to add bright red colour to the gravy. It spoiled the taste completely. They use this powder even in pickles. Taste is more important along with health than the colour. 2. Whenever you need to use garlic and ginger in a preparation remember that garlic gives a sharp taste and ginger a pungent taste with a sort of muddy smell. The best proportion of Garlic: Ginger is 2:1 i.e., the ginger should be half the quantity of garlic. This enhances the taste. 3. Use always circular dishes in a micro oven in place of square or rectangular ones to enable the heat spread faster and hasten cooking, reducing the cooking time. Spread a tissue paper over the glass plate before placing any dish so that if by chance there is any spilling it will not spread. Also, micro wave any frozen items for a minute or two before cutting them. It will be easier to cut and wastages will be less. This entry was posted on February 27, 2011 at 9:57 pm and is filed under Miscellaneous BAth Varieties with tags alu, asafoetida, bagala, beet, black, cardamom, carrot, cauliflower, chilli, cinnamon, clove, colour, curd, dAl, fenugreek, food, ghee, ginger, gourd, gram, green, ingredient, inji, ivy, jaggery, kasappu narthangai, kundru, ladies finger, magalikkizhangu, micro oven, milk, mint leaves, more milagai, mustard, mutter, okra, onion, paper, paste, peas, pickles, potato, pudhina, puli, red, refined oil, rice, salt, spicy, sugar, tamarind, tissue, tomato, turmeric powder, veppilaikkatti. You can follow any responses to this entry through the RSS 2.0 feed. Both comments and pings are currently closed. Great Thought of sharing your expertise with others. Thank you! Shall feel happy if any of my recipes are of any use and I will look forward to feed back with comments and suggestions, if any!